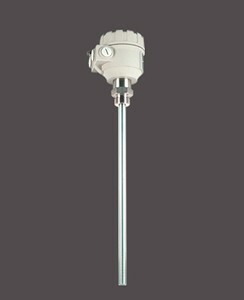 NIVOCAP 2-wire capacitive level transmitters provide an ideal solution for level measurement of conductive or non-conductive liquids. The probe of the instrument and the reference probe (which can be either the metal wall of the tank or installed separately) operate as opposing plates of a capacitor. Between the plates of this capacitor the air is replaced by a medium with greater dielectric constant than the air during filling the tank, therefore the capacitance is changing directly proportional to the level. The incorporated electronic circuitry measures the capacitance difference and converts it to an output signal proportional to level.